No, it's not. There's no A61(M) there. Ah, right - another unbuilt motorway. 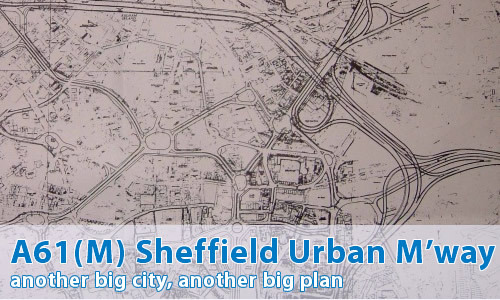 The scheme was developed by Sheffield City Engineers Department, and was then inherited by South Yorkshire County Council in 1974, where some of the less ambitious elements continued through. Like many plans in the 1970s, it missed the boat as far as actually being built, though it was never truly forgotten or shelved. Isn't the northern bit more or less being built to a lesser standard though? It's interesting that the only thing that really differs from that plan to the present day is the grade-separation proposed on the east and north sides. The course of the road as planned almost exactly corresponds to the present-day ring road (including the northern section still being built). What would it have been like to drive around? Completely mad - probably something similar to the Coventry Inner Ring Road (see CBRD)! There would have been a rollercoaster ride pretty much all of the way around, with flyovers, elevated sections, and hills to go up and down. There would have been some desperate lane changing, as some of the junctions were very close together. I seem to remember some years ago (mid 70s? ), Sheffield Council formally abandoning the 'Hillsborough Expressway'. this would have converted the A61 from Sheffield centre to M1-J36 into a motorway. The land was (and still is) reserved from the end of the Halifax Road dual carriageway. Thanks to Haydn Vernals for his assistance with this feature.